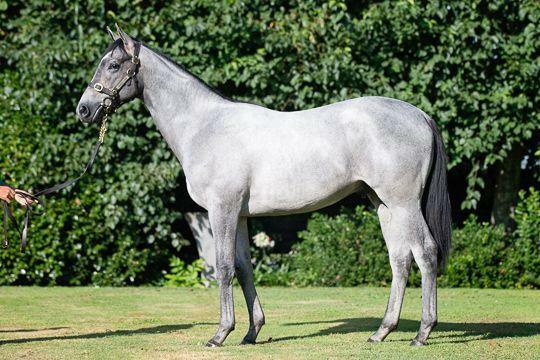 RELIABLE MAN (GB) (Grey 2008-Stud 2013). 5 wins from 2000m to 2400m, £80,400, €1,079,070, US$15,311, A$309,000, Chantilly Prix du Jockey Club, Gr.1, ATC Queen Elizabeth S., Gr.1, Longchamp Prix Niel, Gr.2, 2d La Coupe de Maisons-Laffitte, Gr.3, 3d Longchamp Prix Ganay, Gr.1, Grand Prix de Paris, Gr.1. Half-brother to SW I'm Imposing (ATC Summer Cup, Gr.3) and SW Gale Force. His oldest progeny are yearlings. MAHAMAYA, by Bahhare. Unraced. Sister to HURRAH, CARLISLE BAY - BEST GIFT (H.K. ), three-quarter-sister to BEST SEASON. This is her third foal. Her second foal is a 2YO. Her first foal is unraced. HURRAH (Bahhare). 10 wins from 1200m to 2000m, NZ$293,362, A$214,225, WRC Captain Cook S., Gr.1, STC Kingston Town S., Gr.3, Marton JC Metric Mile, Gr.3, STC Nivea Visage Welter H., Hawke's Bay Te Runga 3YO H., Otago RC The Pub Cromwell 3YO H., 2d ARC New Zealand S., Gr.1, CJC Coupland's Bakeries Mile, Gr.2, QTC Sir Edward Williams H., L, STC Premier's Cup, L, Theraces.com.au Welter H., Schweppes Sparkling Mineral Water Welter H., Marton JC ITM Rural H., Hawke's Bay Auckland Japanese Car Parts H., 3d Hawke's Bay Stoney Bridge S., Gr.1, STC Hill S., Gr.2, CJC Coupland's Bakeries Mile, Gr.3, WRC Trentham S., Gr.3, CJC Cup Meeting Challenge H., Cyril & Jane Smith 3YO H., WRC Trentham Easter P., 4th WRC Thorndon Mile, Gr.1. CARLISLE BAY - BEST GIFT (H.K.) (Bahhare). 5 wins from 1200m to 2000m, NZ$12,875, HK$14,070,500, HKJC Sha Tin Trophy, HK-3, CJC Canterbury Draught 3YO S., HKJC Zhu Jiang H., Ireland Trophy H., Audemars Piguet Deva H., 2d HKJC Audemars Piguet Queen Elizabeth II Cup, Gr.1, Hong Kong Champions & Chater Cup, HK-1-twice, Stewards' Cup, HK-1, Mount Cameron H., Fan Lau H., Arbuthnot H., 3d Cathay Pacific Hong Kong Vase, Gr.1, HKJC Cathay Pacific International Cup Trial, HK-2, CJC South Island 2YO S., L, Ashburton RC Ray Coupland S., L, HKJC Changchun H., 4th Hong Kong Gold Cup, HK-1, HKJC Queen Mother Memorial Cup, HK-3. Wolf Pack. 7 wins from 2000m to 4150m, NZ$112,225, Wanganui JC 92.8 More FM H., 2d Waikato Hurdle, CJC Grand National Hurdle, WRC Actrix for Internet H., 3d Waikato Hurdle, CJC Grand National Hurdle, Hawke's Bay Winning Edge H., Waikato RC Dunstan Feeds Championship Qualifier. Chaperone. 4 wins at 1400m, 1600m in Malaysia. Honor and Cherish. 4 wins from 2000m to 2150m to 2014-15, Southland RC Ascot Park Hotel H., 3d Central Otago RC White Robe Lodge Clare Memorial Gold Cup. BALOTELLI (My Halo). 6 wins from 1100m to 1600m, 690,173Rgt., to 2015 in Malaysia, Perak Gold Vase, L, Selangor TC Tunku Gold Cup, L, Penang TC 3YO Championship Heat 1, 2d Penang Sprint Trophy, L, Penang TC William Inglis & Son Trophy, Perak TC 3YO Championship Heat 2, Selangor TC Wilayah Silver Bowl, Malaysia 3YO Championship Final. SHOCK ATTACK (Inviting). 3 wins. See above. REGAL SHOT (Clay Hero). 5 wins-1 at 2-at 1000m, A$303,050, VATC Sir John Monash S., L, Monash Alumni 2YO P.H., Slickpix P., Procol Harum H., Crewman H., 2d MVRC Schweppes S., Gr.2, Tabaret H., Singapore Raffles Challenge H., 3d MVRC NDRA H., VATC Franklins Ltd H., 4th MRC Sir John Monash S., L. Sire. Stylish Syd - Stylish Sid (Aust.). 3 wins at 1200m, AJC Raconteur H., JV Comans H., 2d CJC Fergies Cantabrian Tavern H., STC Cenovis Vitamins H., 3d AJC Bossley Park Welter H., CJC Tony & Lyn Prendergast St James H.
Thunder Ahead. Winner at 1400m, CJC Riccarton Park Function Centre H., 2d CJC The Second Trial, ECNZ Welter H., Noahs Christchurch Welter H., 3d CJC Johns Auto Plaza H., Laura Fergusson Trust Welter H.
BEST SEASON (Bahhare). 5 wins from 1500m to 1950m to 2014-15 in Macau, Macau Derby, L, 2d Macau Gold Cup, L, 4th Macau Winter Trophy, L, 4YO Prelude, L.